Suit all Norton big twins prior to 1969 Commando's. Please Note: Commando cam shown in pictures for illustration purpose only. Actual Dominator cam does not have tacho worm drive gear. Cam: part # PW3 06-7368. Design (former Norton works rider), developed from the works John Player cams of 1973/74. I believe Mick Hemmings won the race on his first outing with this cam. These are a race cam, but they still work well on the road giving a broad spread of power over the full rev range. Inlet Inlet Exhaust Exhaust btdc abdc bbdc atdc 50 82 84 48. Always check pictures and that the part is correct for your application. Check out my other items. For all your Norton Twin parts, Engine & Gearbox rebuilds. Australia's Largest Authorized Genuine Norton parts Distributor. Enquire about our full range of Norton parts in stock. Find more items in my STORE. 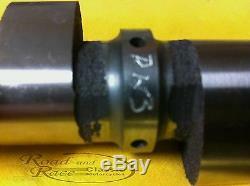 The item "Peter Williams Performance Cam Shaft PW3 For Norton Atlas or Dominator 06.7368" is in sale since Wednesday, December 16, 2015. 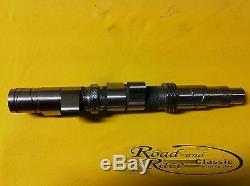 This item is in the category "Vehicle Parts & Accessories\Motorcycle Parts\Classic, Vintage Parts". The seller is "roadnracebridgewater" and is located in Kangaroo Flat. This item can be shipped worldwide.